Golden horseshoes for luck. Lucky golden horseshoe. Golden horseshoes for good luck. Lucky golden horseshoes mean lots of luck for you . 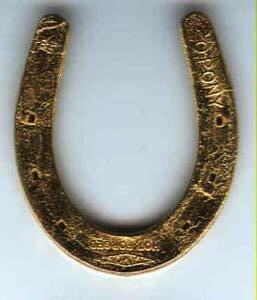 This Golden Horse Shoe Is For Good Luck! horseshoes above your doorway bring good luck! Since you found this horse shoe pointing up, it will catch and hold good luck for you. A horse shoe pointing up never lets its good luck run out. Print up horseshoes, pass them around, share the good luck you have found. Golden horseshoes. Get a horse shoe and nail it above your homes front door. Keep the open end of your horse shoe pointed up to catch good luck and keep it from running out. An upside down horse shoe will let good luck pass you by. Farriers (horse shoers) have got to be like chimney sweeps. Shake hands with a farrier and see. This is Mac-n-Stuff's pages of golden horseshoes.